The yodeling call of the Common Loon sounds a bit like wild laughter, giving rise to the expression "crazy as a loon." In Europe, this species is known as the Great Northern Diver, and it is a superb diver, catching fish as deep as 200 feet! As graceful as this bird is underwater, it is very clumsy on land because the legs are positioned at the rear of the body. Four species of loons have been recorded in Tennessee. The Common Loon is by far the most common. They can be found on large reservoirs and lakes in Tennessee primarily during spring and fall migration, but many individuals spend the winter in the state. The breeding range extends across Alaska and Canada, southward to the northern United States, and also in Greenland, Iceland, and rarely in Scotland. They winter along both coasts and inland on large lakes from Alaska to Newfoundland, and south to southern Mexico. Description: Both breeding and non-breeding plumaged birds can be seen in Tennessee. The breeding plumage (March-October) is striking. The head and neck are black with a white striped collar, and the back is black with an extensive area of white checkering. The non-breeding plumage (September - March) is gray to gray-brown above, and white below with an irregular border along the white throat and chin. The bill is black during the breeding season, and silvery-gray for the rest of the year. Males and females look the same. Double-crested Cormorants have longer necks, bills that are blunt-tipped, and they have no white on the chest or throat. Red-throated Loons are a rare migrant and very rare winter resident in Tennessee. They are smaller, and have a more slender bill that is usually held with an upward tilt. The face is paler and the neck has more white. Pacific Loons are very rare in Tennessee. They are smaller and have an even division between gray and white on the side of the neck. 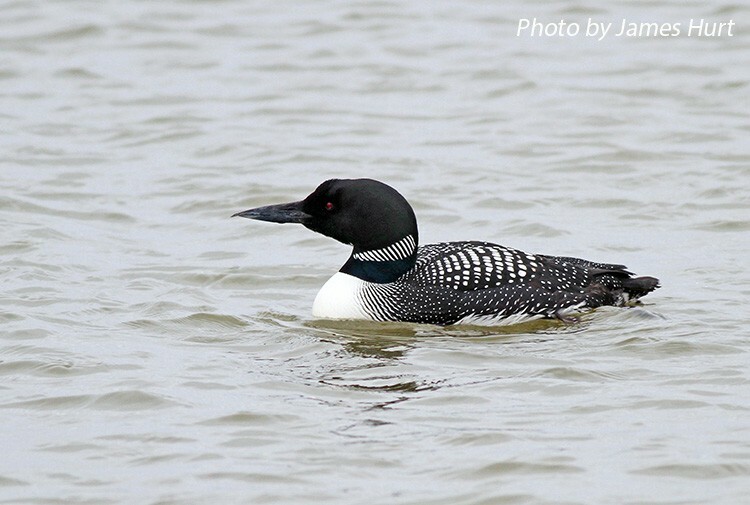 Habitat: In Tennessee, Common Loons are found primarily on large reservoirs and lakes. Status in Tennessee: The Common Loon is a common migrant and an uncommon but regular winter resident across the state. During the fall, birds arrive in early October and reach peak numbers in late October through mid-November. Spring migrants arrive in late March with peak migration occurring during April. The original scientific name for the Common Loon was Urinator imber and was a member of the family Urinatoridae. Due to concerns over declining population numbers, a group, calling themselves the Loon Rangers was formed to conduct an annual census on the breeding grounds in the northeastern United States. These efforts have been largely successful at arresting the decline. The Common Loon is a fish eater and has sharp, rearward-pointing projections on the roof of its mouth to hold on to slippery fish. The feet of all loons are positioned far back on the body making them awkward on land, but able to swim and dive efficiently underwater. They only come on land to nest. The oldest recorded Common Loon was 19 years, one month old. Best places to see in Tennessee: Large reservoirs and lakes across the state, including Woods Reservoir, Old Hickory and J. Percy Priest Lakes especially Hamilton Creek Rec Area, Anderson Road Rec Area, and the dam area, and Pace Point at Tennessee NWR - Big Sandy Unit. McIntyre, J. W., and J. F. Barr. 1997. Common Loon (Gavia immer). The Birds of North America, No. 313 (A. Poole and F. Gill, eds.). The Academy of Natural Sciences, Philadelphia, PA, and The American Ornithologists' Union, Washington, D.C.